Mosaic design is a fascinating art based on paradoxes that must be embraced. Among these are the pieces, multiple objects of simplicity fused into a singular, complex wholeness; the irregularity that springs from deliberation;and more often than not, the creation that is wrought from destruction.Such paradoxes are put into context by the mosaicist when the principles of other visual arts are applied. By shaping tesserae like a sculptor, choosing colors like a paint, and weaving patterns like a fiber artist, the mosaicist presents his or her vision. 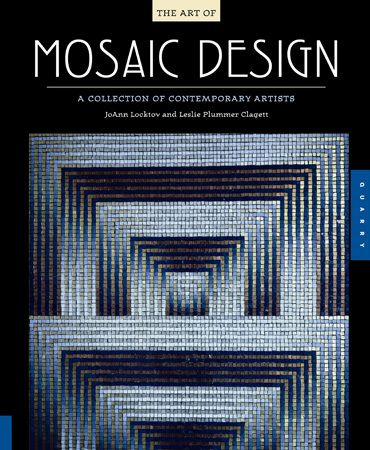 For the first time, in The Art of Mosaic Design, beautiful examples of the contemporary movement in mosaics are revealed; there are works presented here by mosaicists from around the world. Some of these artists have achieved great distinction, other quietly execute the works they are driven to create, but all will surely leave their imprint on the history of mosaic design as an art form. That history is long.Some of civilization’s earliest artistic expressions were rendered in mosaic as part of construction.Simple mosaics made of pebbles decorated pavements found in the People’s Republic of China dating back more than two thousand years.By the fifth century B.C. the art of mosaic design was well established in Europe and the Mediterranean region, while figurative portrayals became increasingly sophisticated. Soon after that, the ability to cut rocks into small, regular units known as tesserae liberated the medium from its strictly functional role. This was a critical turning point for mosaics. Using these uniform pieces, stone murals could be applied to walls, ceilings, or other objects. In addition, widespread production of glass allowed its regular incorporation into mosaics; its radiant, reflective qualities were accentuated against mortar, bringing new life to the art form.